Science content from Fred Seward, Patrick Slane, and Randall Smith (SAO); Bon-Chul Koo and Jea-Joon Lee (Astronomy Program, SEES, Seoul National University). Software development by Jea-Joon Lee, Joan Hagler, Lisa Portolese, and Robert Milaszewski (SAO). This catalog displays X-ray morphology and spectra of galactic and Magellanic Cloud supernova remnants and some pulsars with associated diffuse emission. Figures and derived values are suitable for proposal preparation but, for serious research, readers should use their own filters, spectral fits, and analysis techniques. 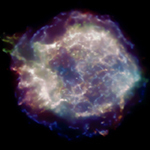 Data are from the Chandra ACIS detector and have been obtained from the Chandra public archive. Exposures are in the range 10-100 ks. Deep 1 Ms observations are not included. Spectral fits were done only to derive luminosities and the quality of the fit depended on the mood of the person inserting data in the catalog. New data are added sporadically. For each object there are images in selected X-ray energy bands, smoothed images, and a three-color image to illustrate spatial variations of spectra. Sometimes a radio image is compared with the X-ray emission. Pulse height spectra are given for a selected features. Tables give count rates, fluxes, and luminosities of remnants, and positions of serendipitous sources in the fields. Event files and images may be downloaded in several formats. The Chandra ACIS instrument has a field-of-view of 8'x8' or 16'x16', so images of larger remnants are sometimes incomplete. Several broken features have been fixed recently (March 2010) and since then 32 new objects have been added.